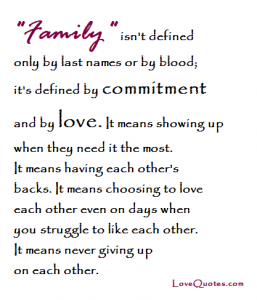 "Family" isn't defined only by last names or by blood; it's defined by commitment and by love. It means showing up when they need it the most. It means having each other's backs. It means choosing to love each other even on days when you struggle to like each other. It means never giving up on each other.